A Federal High Court sitting in Awka Division, Anambra State has issued a bench warrant for the arrest of four persons: Azubuike Jerry, Ikechukwu Patrick, Cosmas Onwuka and Igboanusi Jerry, for alleged production of substandard Liquefied Petroleum Gas Cylinders. 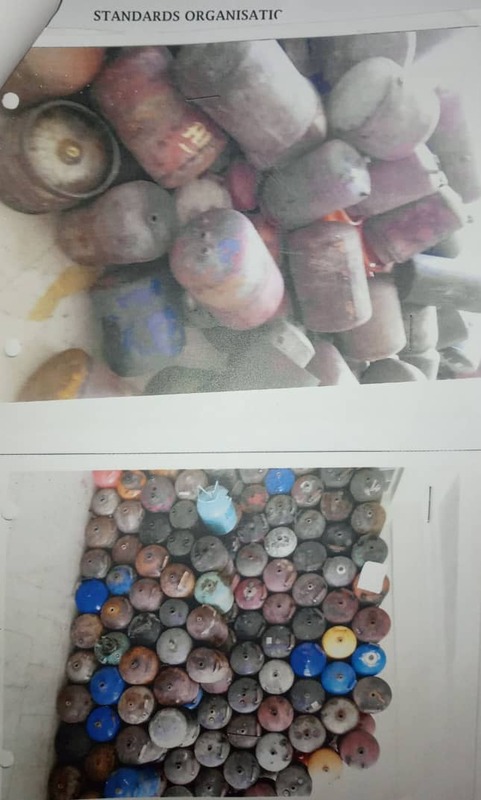 In the matter between the Standards Organisation of Nigeria (SON) and the suspects, the organisation cited that sometime in 2018, its officers carried out a standards enforcement activity at the premises of the United Welders Association 58, Bida Road Onitsha, Anambra State where approximately 1,700 suspected substandard LPG cylinders were warehoused. Lead Counsel for the prosecution, Moor Kuma narrated that SON subjected the said cylinders to testing and they failed critical parameters including: Proof Pressure Test, Burst Pressure Test, Leakage and volumetric expansion tests, following which charge No:FHC/ Awk/C/84/18 was filed at the Federal High Court against the Defendants. At the resumed hearing of the matter on 15th April, 2019, the presiding Judge, Hon. Justice B.O Quadri dismissed the notice of preliminary objection challenging jurisdiction of the court, filed by the defendants through their Counsel George I. Egbere from the law firm of O.J. Nnadi SAN & Co. for want of diligent prosecution. The Prosecution then applied to the court for the issuance of a bench warrant to officers of the Nigeria Police Force and the Nigeria, Security and Civil Defence Corps for the arrest of the Defendants for the purpose of bringing them before the court. “That you, Mr. Azubuike Jerry ’M’, Mr. Ikechukwu Patrick “M”, Mr. Cosmas Onwuka “M” (still at large) and Mr. Igboanusi Jerry “M” (still at large), all members of United Welders Association Anambra State, along 58, Bida Road Onitsha, Anambra State, within the jurisdiction of this Honourable Court on or about 27th, June, 2018, did expose for sale or uses LPG gas cylinders of various sizes (3kg, 5kg, 6kg & 10kg) to the public which did not comply with the Nigerian Industrial Standard NIS 69:2013 (specification for refillable Liquefied Petroleum Gas (LPG) Cylinders) and thereby committed an offence punishable under Section 26 (2) (i) of the Standards Organisation of Nigeria Act, 2015”. The matter was subsequently adjourned for arraignment of the accused persons.